Fresh fish and seafood have become the preferred alternative to red meat and chicken on the grill, and for good reason! From fresh Alaskan salmon to grilled Florida snapper, seafood offers by far the widest range of wonderful choices. And it’s good for you as well. But what if you've never cooked anything but brats or burgers? We take the mystery out of grilling seafood, and make it easy to enjoy the delicious grilled fish you usually eat in restaurants, right in your own back yard. But remember, once you've tried grilled seafood, it’s tough to return to burgers...not that we’d be disappointed if you never looked back. Grill Toppers - stainless steel, aluminum or porcelain-covered metal grill toppers to set on top of your grill grate. Sandwich-style Grill Basket - makes turning small whole fish, fillets, steaks or kebabs a breeze. Skewers - wood or metal, for easy and elegant kebabs. Electric starter or chimney - makes starting coals easy, eliminates starter fluid which will adversely affect flavor. They really can make your fish taste like jet fuel. Wood Cooking Planks - placing your fish on one of these, which you soak in water first, adds a delicate extra bit of flavor, and keeps the fish from falling through the grate. Best when using the lid on your grill so that the fish cooks without turning. Mesquite & hardwood lump charcoal - use some of each to impart a sweet, naturally smoky flavor to fish. Confession - after decades of starting bonfires in our old Weber kettle, we have made the switch to Weber gas and are grilling a lot more often, because it's so much easier!! And less messy! Spring-loaded tongs, metal grill brush and towel to clean your grate; a long handled spatula. Dry herbs and wood chips - dried herb twigs or bay leaves dropped into the fire are a trick used by the French to add flavor to grilled fish. Oak, hickory or apple wood chips soaked in water can be sprinkled over charcoal or gas grills to impart pleasant, smoky flavors to your seafood. Spray bottle of water - to douse flare-ups on charcoal grills that can quickly turn beautiful fish to cinders. The following selections are easy to cook because of their firm texture, and can easily be placed directly on a well prepared grate. Beginners, start here! Before you put your fish on the grate, make sure that the steak or burgers you cooked last aren't hanging around. Scrape the grate with a metal brush. For gas grills, make sure the grate looks free of cow before putting on your seafood. On charcoal grills, after scraping, spray a little non-stick spray on the grate before starting the fire. Adequate pre-heating is essential to the success of your seafood grilling. Start by using enough charcoal to cover the the grill bottom when spread out, and allow it to burn to a light ash before cooking. Spread the coals evenly. Remember -- 10 minutes cooking time per inch of thickness of your fish, measured at the thickest point, over medium high heat. Don’t overcook! Stay by the grill, don't wander off for an extended chat with the neighbors. Fish cooks really fast, and keeps on cooking even after removed from the grill. Err to the rare! Gas grills should be set to medium high, around 450 degrees. Test the temperature by holding your hand about 5 inches from the grate. If you can count to 5 slowly, it’s just right. If it’s too hot, let the coals burn longer, or turn down the gas. Always pre-heat your grate, and spray vegetable oil on grate BEFORE putting it over the fire. Remember, fish tastes best when bought fresh and cooked quickly. Marinating - placing your seafood in a flavorful marinade for 15 to 30 minutes before cooking can turn a good meal into a great one. 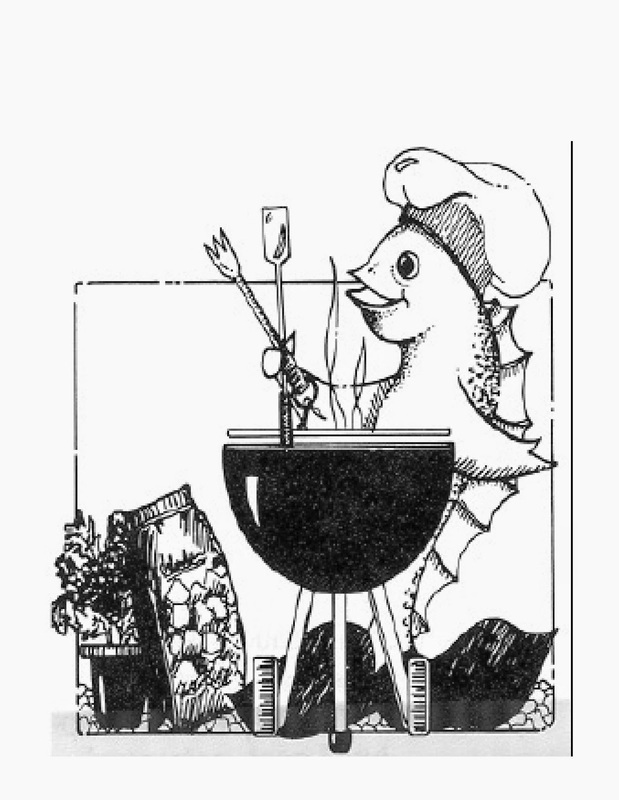 Try one of Burhop’s delicious all natural marinades - ask your sales clerk for ideas. Toppings - we have some outstanding rubs plus great salsas and relishes that are fantastic with grilled fish - check our Burhop’s Pure & Simple® case and ask your Burhop’s clerk for items that are great additions to grilled seafood! If you don't live near one of our stores, think fresh salsas, pestos, marinades, rubs. Grilling Season & Bird Migration -best time of the year! After over 35 years of cooking over charcoal in the summer, we bought a gas grill last summer in anticipation of a wedding party for our daughter in our back garden. Trying to have a fire going with 70 people milling about didn't seem like a good plan. I have to admit, I don't miss the charcoal. The fish husband never much liked building a fire, and now he doesn't have to. At some stage, I guess we'll have to get the gas tank refilled, but we'll cross that bridge when it runs out, hopefully not in the middle of a dinner party. For the back yard wedding party, we had Chef Jaime* come and grill a variety of seafood kebabs, shrimp, salmon, swordfish and tuna - and they ate it all. It was a great party item, because kebabs cook quickly on the grill, they look festive, and no one has to cut anything, they could just slide everything off the skewer and onto their plate and eat with a fork. Besides kebabs, one of my favorite fish for the grill is salmon - leave the skin on, and cook flesh side down first, then flip to the skin side. You can add pesto to the top for the last few minutes of cooking, then scoop the fish right off of the skin to serve. (When the grill has cooled, we take the fish skin off and give some of it to our dog, who thinks it's the best thing ever). Next favorite is tuna - instead of grinding up tuna for tuna burgers, I like to get pieces about 1/2" thick, one per person, grill them quickly, just rubbed with olive oil and a little salt-free spice rub, then serve them on a fresh bun with some of our creamy coleslaw in the bun with the tuna. The tuna should be served rare, so about 1 to 2 minutes per side over a medium high flame will be just about right. How many other kinds of burgers can you cook and serve in under 5 minutes! All of the meatier fish, like swordfish, halibut, marlin, mahi mahi, etc. are great for grilling - they can be marinated before grilling, rubbed with spices and oil, served with sauces or toppings added at the end of the cooking time or just before serving. Little or no mess in the kitchen, just make sure that someone periodically uses a metal brush on the grill to remove old food, especially if you grill a lot of meat as well. We wipe our grate with olive oil after cleaning, to make it less likely for the fish to stick to it. If you have any grilling questions for us - please ask! Last but not least, the bird migration - it starts in March with the early water birds and sparrows, builds through April, and peaks in May, when the wood warblers, orioles, tanagers, thrushes and more come for summer nesting or just passing through on their way north. We love birds - we have several feeders in our garden, and a bird bath that we heat in the winter so there's always water for the birds to drink. We have traveled the world looking for birds, and find them more and more wonderful the more we learn. Birds are small, especially warblers, but so worth looking for - when you're outside in your garden enjoying a lovely seafood dinner, look around to see who else is eating dinner there - you may be lucky enough to see an oriole or a ruby throated hummingbird - we feed the orioles organic grape jelly, and they reward us by bringing their friends and family, a brilliant spectacle of orange and black. The hummingbirds love the salvia we plant in pots on our deck, and they come and eat right beside us. What could be better than sitting on your back deck or patio, enjoying a delicious seafood meal with your feathered friends? *Planning an outdoor party? We have staff members who can come and cook for you - contact us at burhopsseafood@gmail.com. Availability is limited, so contact us as soon as possible.